Omnimap has over 250,000 map items on our web site and is one of the world's largest specialty retailers of paper and digital maps, hiking guides, travel accessories, map pins, globes, flags, and more. Our specialty is international maps and we offer topographic maps, travel maps, and wall maps for nearly all countries and regions of the world. The Premium Style Wall Map is an attractive display wall map with complete map detail. It is an ideal choice for applications that benefit from both a colorful display and full reference information. The Premium Style Wall Map features highway detail as well as colorful shadings of populated places. This map comes laminated using 3mmm hot lamination, which protects your wall map and allows you to write on it with dry-erase markers. The map is available with several different mounting and framing options - see below. Available for all 50 states! With or without Zip Codes! 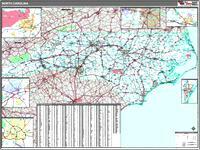 A thumbnail image of the North Carolina state wall map. Sample detail ffrom the North Carolina state wall map. 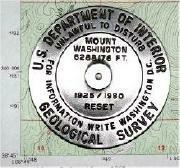 A thumbnail image of the Virginia state wall map. Sample detail from the Virginia state wall map.